repairing sheet rock, cleaning up building penetrations, clean up material and reinstalling the roof gutter down spouts. We also have contractors out working on the balance of the in-line fans for the strip and wash duct and the K-hut duct. it contained the platform side supports for both VIRUS right and VIRUS left and a top work platform for one of the VIRUS enclosures. We have been doing test fits of these enclosures in preparation for installing all of them in two weeks. John Good, mechanical engineer from Austin, was here for the last two weeks to work with the laser tracker. The first days were spent confirming the current mount model then making refinements to it. We now believe we have the best mount model that can be obtained with this laser tracker. Some work at night was done this week. We went on sky to test the mount model, see if the position of the Celestron Alignment Telescope (CAT) was good enough for future testing. We found the RA, DEC and rho offsets are now working and that the center of rotation falls at the corner of the CAT. Tests of the geosynchronous satellite tracking software within TCS suggests that it is probably working although the CAT is just to small to see these 11-13th mag objects. We believe we are sufficiently ready for any future metrology tests. With this alignment out of the way we put the CCAS tower mirror alignment system back together and have confirmed that all of the components are well aligned and working with alignment to better than 0.5″. Work in the spectrograph room continues. One of our TOs finished the touch-ups required after the contractors scratched the paint in the area where the HPF enclosure will go. With that done we are ready for the HPF enclosure to arrive next week. We also received the mounts for the HRS sensors. These will be part of the system that monitors and controls the HRS temperature to improve performance in velocity stability. The really big news is that we installed the large liquid nitrogen tank behind the K-hut. This required days of preparation and coordination between the HET, Crane services, Praxair and Midwest Cryo teams. 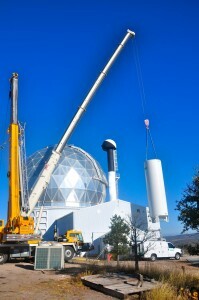 The two cranes made quick work of putting the crane in place and by lunch the tank was bolted down. In the two following days nearly all of the plumbing to the K-hut vaporizer and the filling location were installed. This entry was posted in HPF, HRS II, Observing, VIRUS, WFU on October 31, 2014 by shetrone. Our electrical tech began work on Virus enclosure this week. We will be installing all of wiring and breakers in the enclosure. One of our telescope operators is working with one of our programers to sort out the remaining problems with the wiring to the anemometers. The next step will be to set the zero point of the wind vein in the software which requires them to point the anemometers in a known direction and note the position read out. We also installed a new digital rain gauge this week. We will now be able to record when we have rain events in the weather archive. Work on the TCS continues and some bugs in the RA and DEC offsets were found and removed. Offsetting in X,Y, rho are still to be done. This was supposed to be the last week for work on the Facility Thermal Management Project. Veliz Construction finished the back stairway past the K-hut to the liquid nitrogen slab. This was a requirement by the people who will be filling the liquid nitrogen tank. A fair amount of time was spent putting insulation around pipes, cleaning up the site and small projects. The consulting engineers from El Paso came out on Thursday to generate the punch list of remaining items for the contractors. This entry was posted in WFU on October 20, 2014 by shetrone. For our large project which we call “Facility Thermal Management project” Veliz Construction began the mounting of the access stairway that serves the LN2 tank. ARC was onsite to continue the pipe insulation and insulation protection. Weathers Electric landed the Advantage Chiller power line into the HET main panel and replaced the 400 amp fuses in the the 112 KVA transformer disconnect panel with 350 amp fuses. Weathers Electric made the final connections for the new telescope Advantage Glycol chiller 3 phase power. This glycol chiller will help us cool the tracker motors and keep all of the electronics in the tracker at ambient temperature. We continue to work on the VIRUS Safety system which will have alarms for dealing with the large liquid nitrogen tank behind the control room. It senses liquid nitrogen flow and oxygen levels around the facility. It is a fairly fast system that will take more than another week to complete its installation. This week we began cleaning up the spectrograph room including moving around the large air tanks to make more room for the HRS insulation and the HPF enclosure, which will show up the 2nd week in November. Our goal is to hold the inside of the HRS enclosure to a very tight tollerance so we are current experimenting with RTD temperature sensors for the Spectrograph room to monitor how tightly we can control the temperature with the new air conditioning system recently installed. This week we had some night time engineering work using the CAT (Celestron Alignment Telescope). This small telescope is mounted in some V-blocks near the center of the tracker where the future corrector will go. This small telescope will allow us to test guiding metrology and TCS software on the sky. This week we spent the time trying to align the telescope parallel to the rho axis, moving it to the center of the rho axis and then finding the offsets to align it along the central optical axis of the primary. 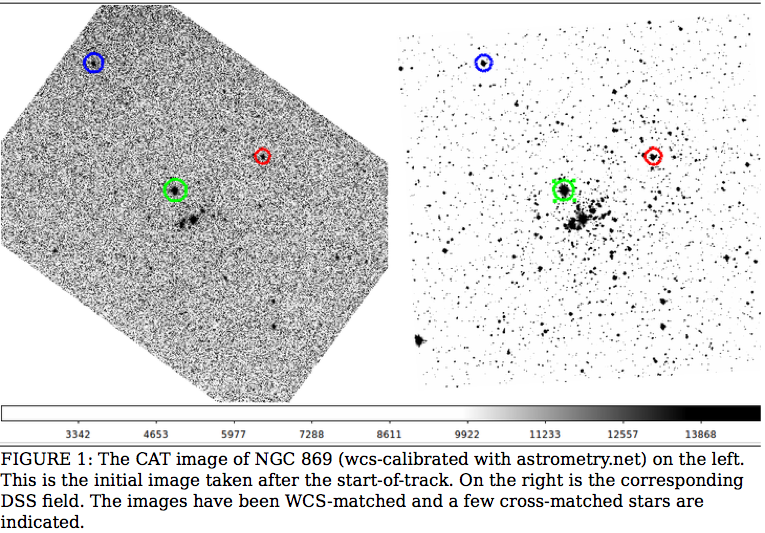 Once done we were able to take a quick image of an open cluster, NGC 869, and confirm the plate scale and orientation and do some preliminary analysis of the newly installed TCS commands for rho, theta, phi, RA and DEC offsets. We have some debugging to do but this is a big step forward and will allow us to get valuable feedback before the corrector arrives in January. This entry was posted in WFU on October 12, 2014 by shetrone. 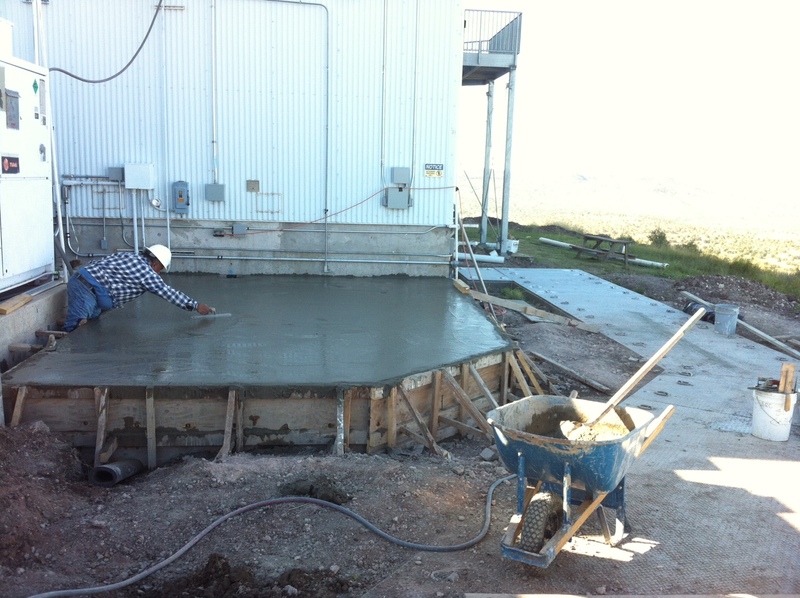 For the Facility Thermal Management Project, Veliz construction spent the week preparing and finally pouring the concrete pad for the large liquid nitrogen tank which will feed VIRUS and eventually the HPF. Weathers Electric began working on the Krabben hut exhaust fan wiring after ARC installed the fan early in the week. Veliz Construction also finished the cinder block wall around the new Mitsubishi compressors out in the remote thermal area. One of the engineers from Austin came out this week to work on the tracker mount model using the laser tracker. They were able to run several long tests at night and will start the analysis of the data. technique involves removing the seal clean it and then reinstall it such that the hairs are not curled the opposite direction as before. We are about one third complete with this effort. Our new Opto-mechanical technician started today. She joins us from Austin and has already driven the JLG above the mirror and done an inspection of the coating tank in the clean room. We received the work platforms for the VIRUS enclosures. These go on the inside of the enclosure but outside the truss. We found that the top set of platforms are to wide and will have to be modified. This entry was posted in WFU on October 3, 2014 by shetrone.